The Yolanda collection by Jennifer Taylor Home is the perfect addition to any living space looking to add a bit of a traditional flair. The fabric selected for the collection features Polyester and Rayon blends and engineered for long life. Our wood frames are made from kiln dried birch wood which provides exceptional support and stability. This chic and traditional jacquard design is accented with hand-tufting, cords, and a fringe trims. The Yolanda is an ideal choice for the entryway, hallway or living areas. This ottoman brings class and lounging comfort to any room in the home, whether it’s used as a footrest or additional seating for guests. We offer a unique versatility in design and make use of a variety of trend inspired color palettes and textures. Our products bring new life to the classic American home. 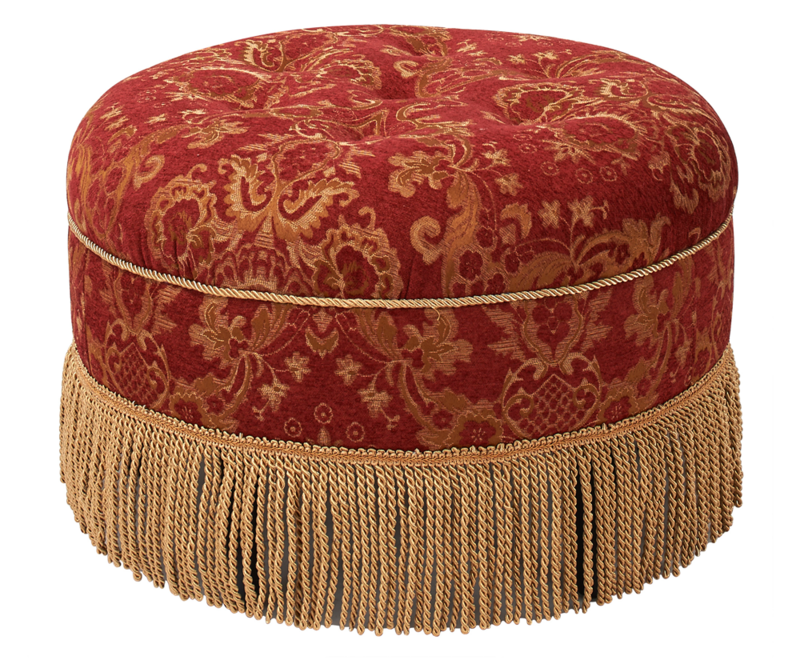 The Yolanda Decorative Round Ottoman is the perfect addition to any living space looking to add a bit of a traditional flair. This chic and traditional jacquard design is accented with hand-tufting, cords, and a fringe trims. This ottoman brings class and lounging comfort to any room in the home, whether it’s used as a footrest or additional seating for guests. color is true to what you see; extra fringe makes it fancy and creative. i use it to sit on while putting on socks, etc, while dog uses it to hop onto higher furniture. Wow, this is really nice. Just as pictured, the color is right on point, nice soft red and lovely gold. Matches my living room chairs perfectly. And I got an added bonus, its turned into a cat toy. My small male cat can get under the ottoman and hide from my larger female who doesn't fit. He peers out from the fringe and baps at her when she tries to get him. LOL! So much fun. Elegance of the past. Beautiful match in our living room. Love love my footstool it's very true to the description very elegant looking. Not the highest quality, but it is perfect for what we needed. 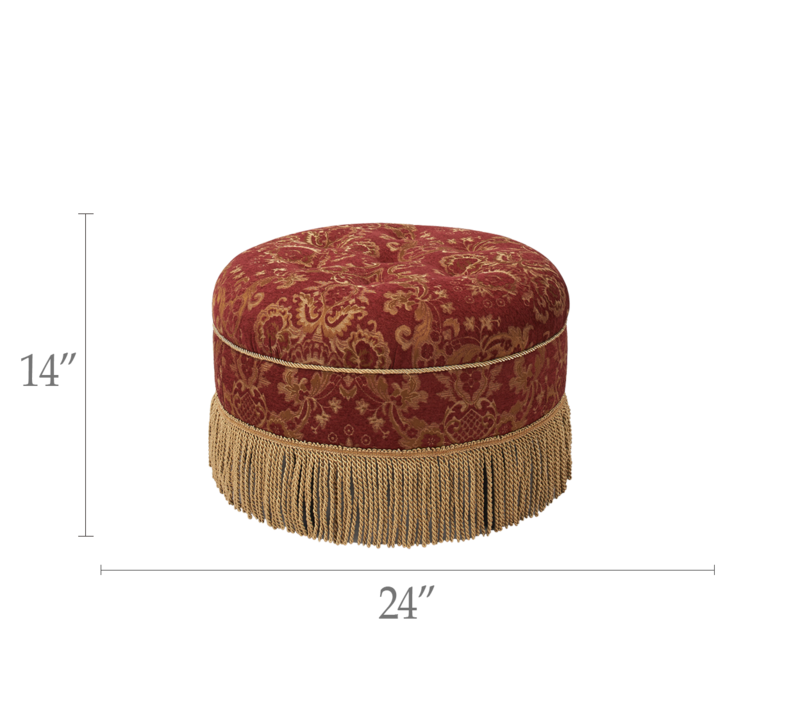 This ottoman is just lovely, so perfect for my home. I absolutely love it. It's large and room for your feet and your book.